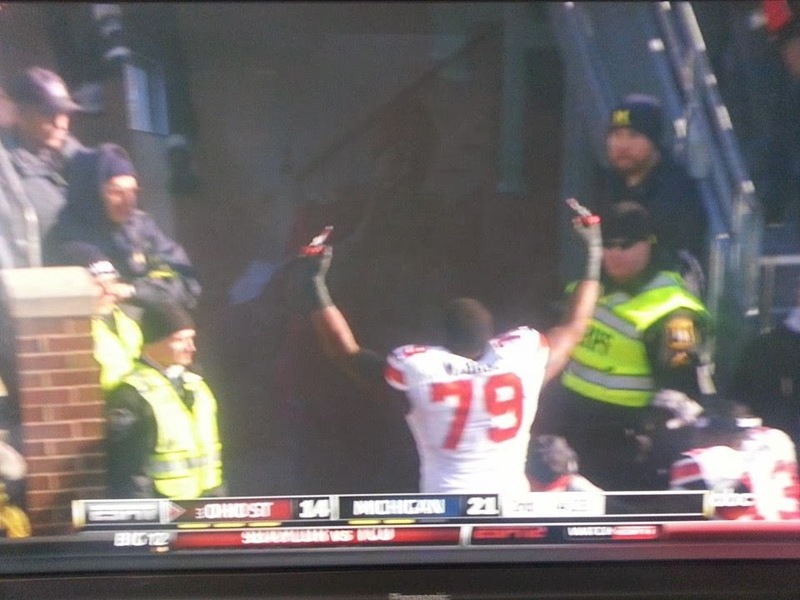 It's not like your normal Ohio State-Michigan game lacks drama, hype, passion, heartbreak, and glory. But 2013's edition lived up to the hype and more, and kicked off the amazing day in college football we just experienced. Ohio State came into The Big House as a huge favorite, in the 14-16 point range, and the pitiful Michigan offense promised to make this a cakewalk. But it never is. Devin Gardner came out playing like he hasn't in a long time, and I, for one, was seeing shades of the nightmare of 1995 early in the first quarter. However, it wasn't meant to be, as Ohio State roared back with their predicable offensive explosion, marred only by a Carlos Hyde fumble (after a Herculean-effort on a run up the middle). Too bad the defense wasn't up to the task. It took an interception by Tyvis Powell on a two-point conversion after the porous Buckeye defense let the Wolverines back from a two-touchdown deficit to seal the game. A huge fight after a kickoff marred the first half, and of course that will be playing in OSU-UM hype films for the next century. Unfortunately it cost Ohio State a ton more than Michigan, as speedster Dontre Wilson and starting O-lineman Marcus Hall were kicked out for punching. In addition, Hall gave the 100,000+ fans in attendance a nice double-finger salute. Undoubtedly lots of people are using that as their Facebook cover today. Now on to Indianapolis next week, where Ohio State plays the stingy defense of Michigan State. If Braxton Miller and Carlos Hyde are on their game, I don't see any way any defense can hold the Buckeyes under 30 points. Now, if the defense of Luke Fickell plays like the defense of Luke Fickell, 30 points may not be enough. .....and the Ohio State bus as well (as shown on the Instagram video captured by Ohio State WR Frank Epitropoulos. Now what? Likely today's polls will have Florida State the new #1, and Ohio State the new #2. Likely (but not as likely), if Ohio State takes care of business against MSU and Auburn beats Missouri in the SEC Championship game, Ohio State will still make the BCS Championship game as an undefeated major-conference team (vs. Auburn, who's bigger wins also come with a loss to 3-loss LSU this year.) But that will come with howling from every corner of the sports-talk blogosphere. And to be honest, I can see the point. Auburn beat #1 Alabama, Texas A&M, and lots more. Ohio State didn't. But that's the way the ball rolls sometimes. Wins and losses count too. And moreso, so do votes. Nobody wants a playoff more than me, but in this case, we don't have one. And if for some reason, (if they beat Michigan State and) Ohio State gets jobbed out of a place in the BCS Championship for a one-loss SEC team, there will be no justice in this world. Which is a shame, because Saturday showed how great college football can be. And once we have a playoff, it will be that much better.